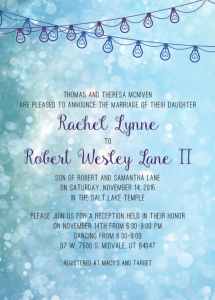 Your high end, luxury wedding invitations can be in your hands in less than 2 weeks! 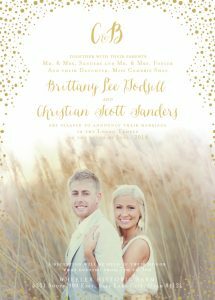 Luxury wedding invitations can reflect the romantic, luxe vibe that you are going for in your wedding theme. 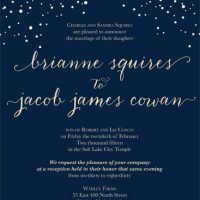 With The Invitation Maker, you can realize your dream of custom, stunning wedding invitations that will take your recipients breath away. 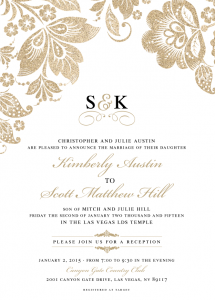 They will be excited for your luxurious, chic wedding after opening your customized invitations. 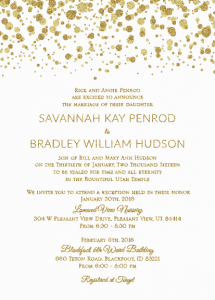 Our shop is exclusively online so you get all the benefits of beautiful invitations without the time investment or higher price of a local shop. 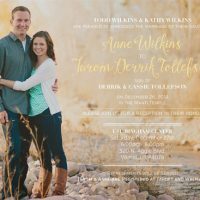 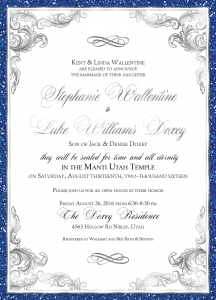 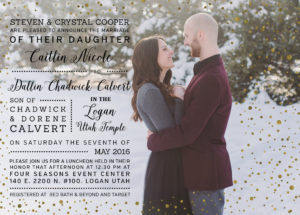 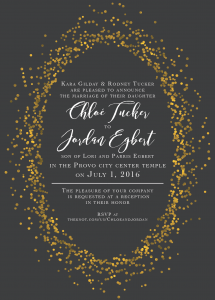 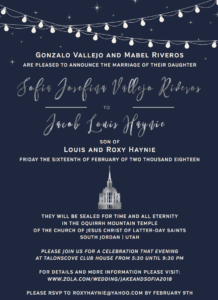 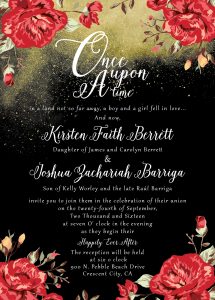 You’ll work one on one digitally with a designer from our offices in Utah to create the couture invites you want. 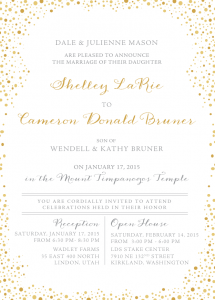 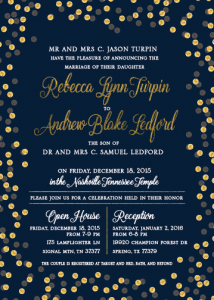 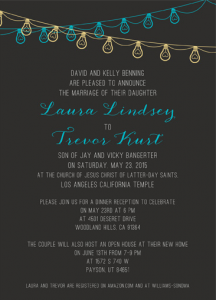 Do not be boxed in by the limited options at traditional invitation printers! 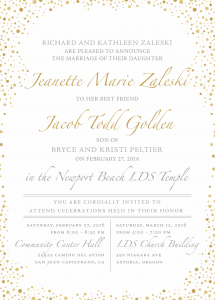 With The Invitation Maker, your possibilities are endless. 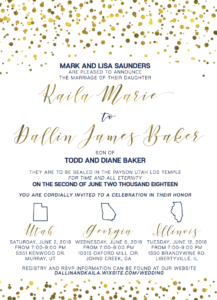 How do I get started with The Invitation Maker? 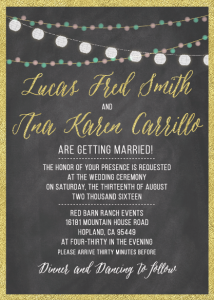 If you have images from Pinterest or elsewhere that you want to replicate, share them with your designer to start the discussion about your tastes. 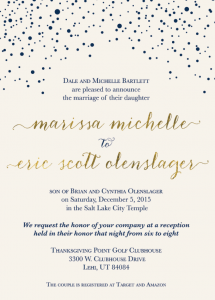 Or you can get started today by looking over our massive gallery of examples from past clients. 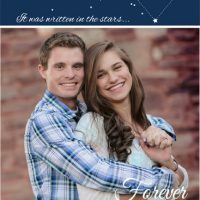 Pick and choose features from multiple templates that you like, and The Invitation Maker will combine them to create your picture perfect announcements. 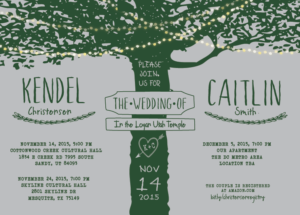 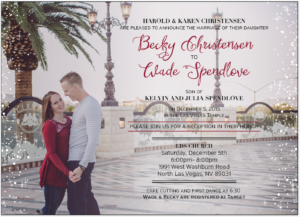 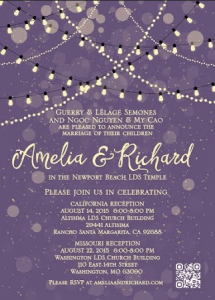 Our experienced designers are standing by to get started on your invitations right away. 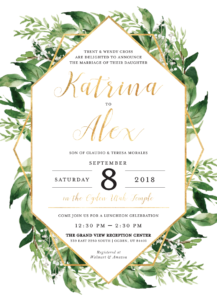 You can choose from a variety of upscale options including foil, one or two sided printing, black and white or full color, rounded corners, save the date magnets, white or cream colored envelopes, etc. 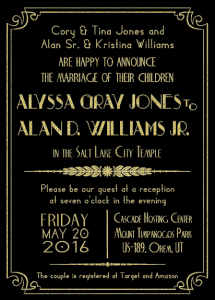 Once you’ve come up with your final design, options and other add-ons, we will print it as quickly as possible. 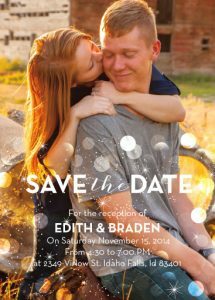 You can expedite the printing and shipping options if you need to rush the order to get your invitations faster. 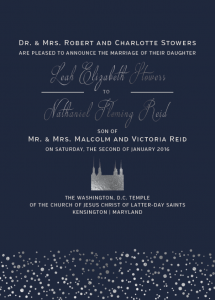 Getting started is as simple as browsing our examples today.